A strong point of criticism of the Iraq war has been its death toll. If you've been reading the anti-war literature, the number you've probably heard is 655,000, or something like it. This number comes from the Lancet's study of the number of deaths between March 2003 and July 2006, and what they actually say is that in that 40 month interval there were between 426,369 and 793,663 deaths. Any study of death tolls with a margin of error of 367,294 deaths should raise alarm bells. So agreed the Iraq Body Count Project, who released a peer-reviewed analysis and criticism of the Lancet study (which is, by the way, not itself peer-reviewed). Among the problems they find with the study are its implications that "less than a tenth of [seriously injured Iraqis] received any kind of hospital treatment" and "Half a million death certificates were received by families which were never officially recorded as having been issued". They point out that another study used a comparable method to that of the Lancet study, but worked with a considerably larger sample, an found a far lower death-toll estimate. UN reports find 80 violent deaths a day but the Lancet study would imply 1,000 deaths a day. Let that sink in: by the UN's reckoning the 655,000 figure is a twelve-and-a-half-times overestimate. The IBC's criticisms go far beyond this, and are positively damning - the Lancet quotes false and unsourced figures, underestimates the pre-war death rate, implies that the Iraqi media is mostly only reporting the smaller incidents of violence, and ignoring the larger ones, and so on - so I won't waste any more time on it. An even larger figure the less scrupulous and honest members of the anti-war movement sometimes tout is that of the ORB survey, which cites a death toll of 1,033,000. Again, it's drivel. A peer-reviewed paper published in Survey Research Methods strongly criticises the ORB survey, "describes in detail how the ORB poll is riddled with critical inconsistencies and methodological shortcomings" and concludes the ORB is "too flawed, exaggerated and ill-founded to contribute to discussion of the human costs of the Iraq war". Epidemiologist Francisco Checci and the IBC agree. Journalist John Rentoul puts it this way: the ORB estimate "exaggerate[s] the toll by a factor of as much as 10" and that "the ORB estimate has rarely been treated as credible by responsible media organisations, but it is still widely repeated by cranks and the ignorant." So why does this matter? If the true death toll (shouldn't that be "life toll"?) was less than than a twelfth of the Lancet's figure, that's still a lot of people, and they all count. According to Slate journalist Fred Kaplan, who strongly opposed the 2003 invasion of Iraq, that's precisely why it matters: "Here lies the danger of studies that overstate a war's death toll. The war's supporters and apologists latch on to the inevitable debunkings and proclaim that really 'only 100,000' or 'only 200,000' people have died. It's obscene—it sullies and coarsens the political culture—to place the word 'only' in front of such numbers." Well, if the Iraq war costing lives counts against it, then saving lives must count its favour, right? Let's do some number-crunching. The Iraq Body Count project, which is rather more reputable among epidemiologists, at my time of writing places the death toll at "111,593 - 121,997" deaths, and concedes that its methodology is more likely to provide an underestimate than an overestimate. For a liberal estimate, then, I'm willing to take the upper limit and double it. That's 243,994 deaths in a period of 120 months; 2,033 deaths per month on average. Contrast this with the Lancet's estimate of 655,000 in 40 months, or 16,375 per month on average. The Human Rights Centre in Kadhimiya was formed by Iraqis after Hussein (why does everybody feel they're on a first-name basis with him, by the way?) was toppled from his throne. By going through the archives left by the Hussein regime, which kept records of all the people it killed (as a punishment for things like political dissent), they found that around 70,000 people per year were being killed by the state. That's 5,833 people per month on average. Add to this the ~500,000 people who died as a consequence of the sanctions Iraq was under between August 1990 and March 2003 - that's an average of 3,311 people per month. 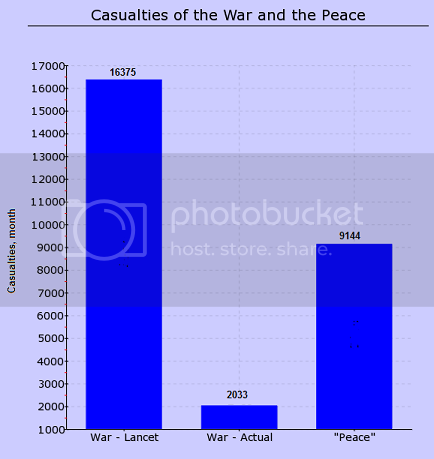 So here are the figures, as best we know them: according to the Lancet survey, 16,375 per month died as a result of the war. According to my doubling of the IBC study, 2,033 died per month as a result of the war. According to the alternative, 5,833 plus 3,311 - that is, 9,144 - were dying per month as a result of the peace. This is why it matters that the Lancet survey was an extreme overestimate - were it not, the Iraq war would have cost hundreds of thousands of lives. As it stands, it saved them.